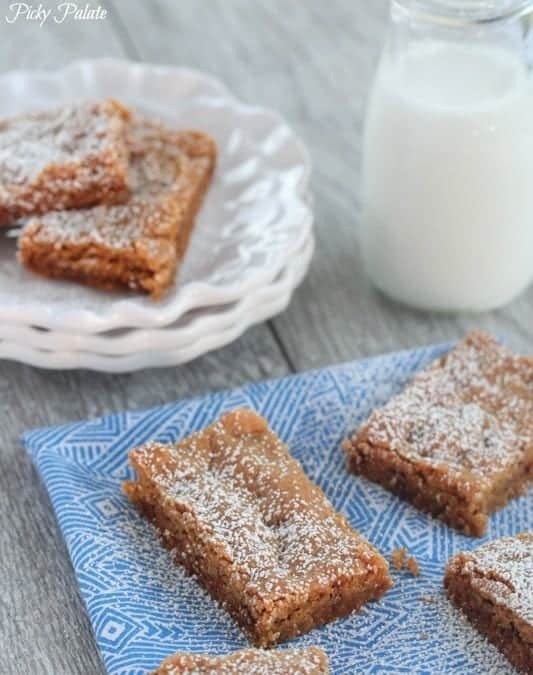 These Soft Gingersnap Cake Bars make the perfect dessert to bring to family and friends this season! I can’t tell you enough how much everyone loved these bars at my house. They are about one of the easiest desserts you’ll make and can we talk about how delicious they are? 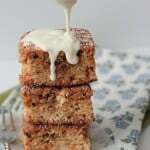 A perfect, soft cake like chewy bar with just the right gingerbread flavors. All ingredients into the mixing bowl. Almost done. Ginger, cinnamon and lots of cinnamon chips! Transfer your dough to a parchment lined baking dish, press evenly then bake! Let cool then cut your bars into nice little squares. 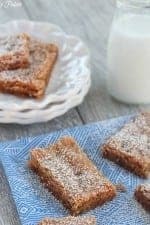 Dust with powdered sugar and EAT. 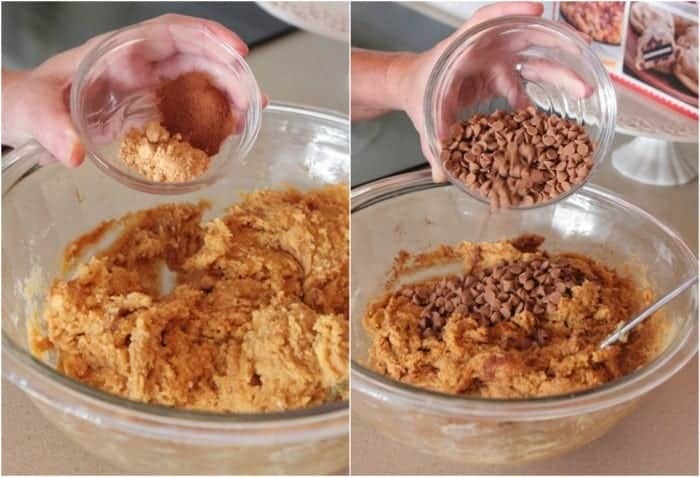 Place cake mix, butter, egg, molasses, ginger, cinnamon and cinnamon chips in a large bowl, mix to combine until dough forms. Transfer to prepared baking dish and press evenly. Bake for 30-35 minutes, until baked through. Let cool for 30-60 minutes before cutting into squares. 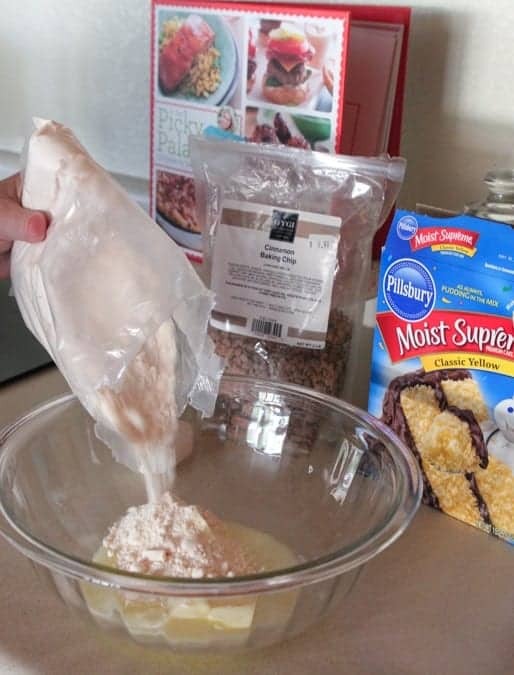 Before serving, dust with powdered sugar. Sounds wonderful, can’t wait to try! What if you don’t have molasses on hand? Is there a good substitute? Thanks! These sound so yummy! I want like 10 right now. This is so happening for this Christmas! 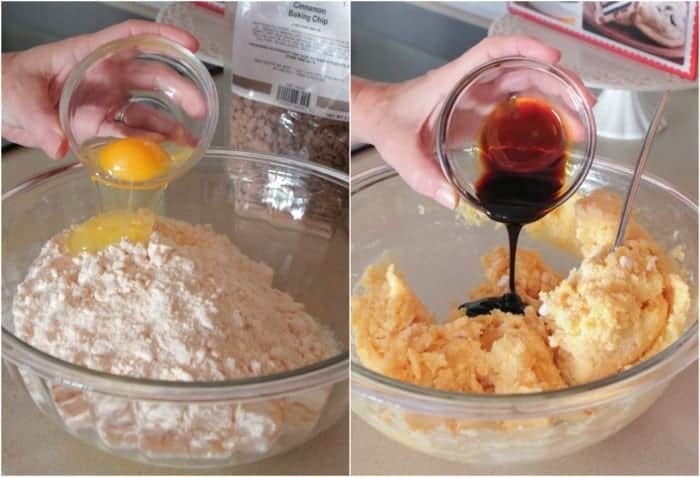 Great dessert for the holidays! Gingerbread/gingersnaps is one of my very favorite holiday flavors, so these would make me very happy!! I looove the flavor of gingersnaps! THe perfect holiday treat! These are so awesome!! Perfect for the holidays! I love how easy these are to make. They are so holiday perfect. These look positively delightful! I adore gingersnap! Sounds delicious! I always have problems finding cinnamon chips. Does anyone have any suggestions for the Milwaukee area of a brand or where to find? Thanks! I couldn’t find cinnamon chips at two different grocery stores so I gave up and just used white chocolate chips and added extra cinnamon to the dough. My son and I agree – they’re delish! I can see why everybody loved these bars so much. They look fantastic! We are huge fans of ginger in any form, so I know my family would go crazy for these. mmmm, these look SO good!! delicious! anything with these flavors are my favorite!! 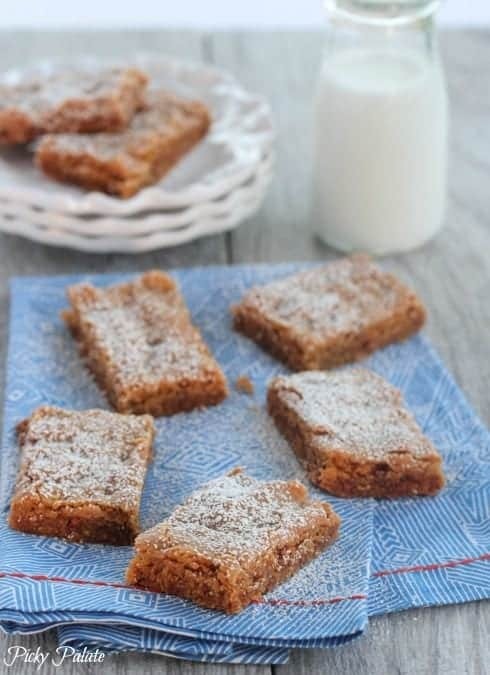 These are a perfect holiday treat, love the soft gingersnap idea!!! 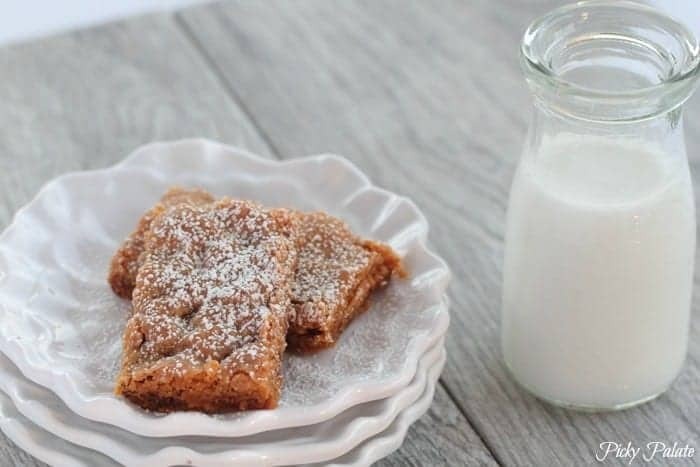 These bars look so easy and delicious! Right up my alley! Oooooo…my family would love these bars!! That pan of bars wouldn’t stand a chance around me. These sound awesome, and I love how easy they are! I made these last night, Jenny! I brought them to school this morning, and both kids and adults have loved them! Instead of dusting with powdered sugar, I drizzled them with an icing made from powdered sugar, milk, and just a bit of cinnamon (just enough so that you see the little brown flecks in the icing). 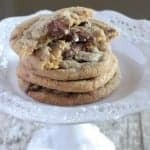 This will definitely become one of my “oh my goodness, I need to make something sweet for that meeting/party/dinner tomorrow” recipes! Another hit from PickyPalate! I made these this evening and even though only baked for 20 minutes they were anything but soft. Flavor was good but bars were crisp. Should there be another source of liquid. They were tricky to spread in the 9 x 13 as well. A smaller pan. Please advise if time permits. Enjoy your blog! The 30 minute baking time was way too long for me as well. They were hard and crunchy. I baked them again, this time for about 16 minutes and they were perfect. 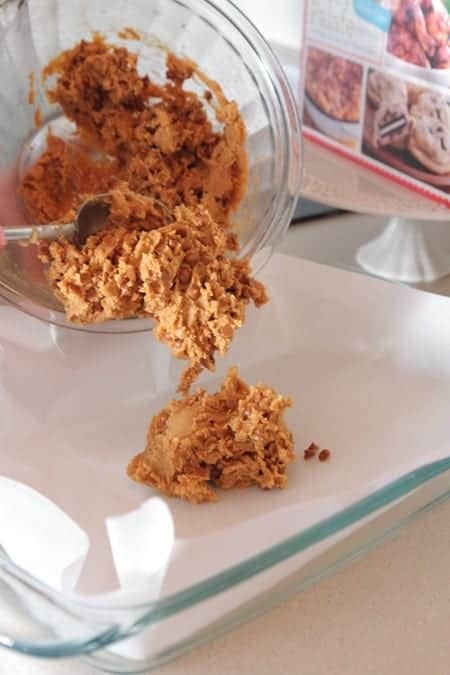 I took them to a get together with some friends, and they said they were “like crack!” As far as spreading them in the pan, I pressed the dough down with my hands and that worked really well. Are you no longer linked to Ziplist? I was trying to save this to my recipe box and I don’t see the link for this or the pesto soup. purpose, and get the most recwnt news.